On January 9, 1924, a standard transaction occurred between the Boston Braves and Chicago Cubs. Veteran Cubs third baseman John Kelleher was picked up on waivers by the Braves for the price of $4,000. 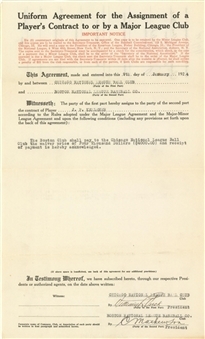 This 8 ¼ x 13 ¾ inches double-sided document records that standard transaction, but what makes this piece significant is that it has been signed by two men who left a tremendous imprint on the game: Christy Mathewson and Bill Veeck, Sr. Mathewson had won 373 ballgames and had been the idol of millions of young baseball fans who looked up to the great pitcher for his clean living and almost unbeatable record. 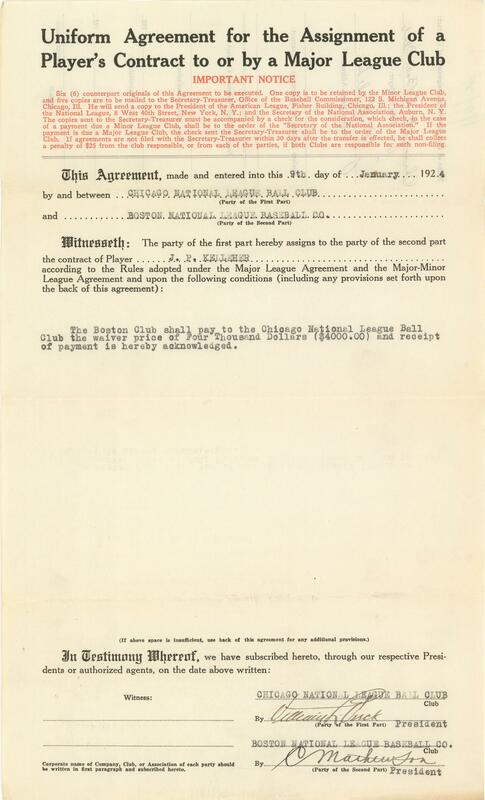 After his playing days, Mathewson was president of the Boston Braves and it is in this capacity that he signed this document. The Great Matty was in the final stages of the tuberculosis that would tragically claim his life just over a year later. Bill Veeck, Sr. was one of the first modern team presidents, a position he held with the Chicago Cubs from 1919 until he passed away in 1933. Veeck was responsible for turning around a moribund ball club and turning it into a National League dynasty that would win pennants in 1929, 1932, 1935 and 1938. Of course, he was also father to baseball’s front office “enfant terrible,” Bill Veeck, Jr. Both icons have signed this contract in black fountain pen. 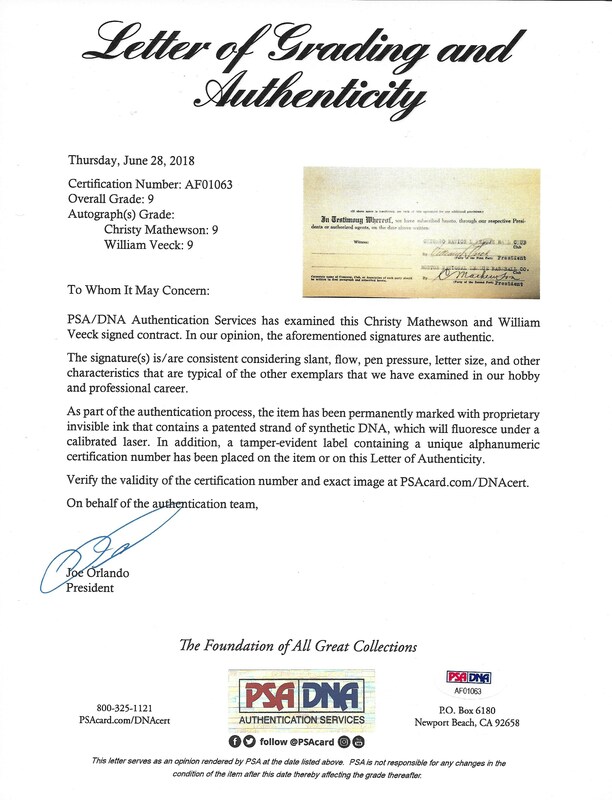 The signatures have been nicely preserved within the interior pages of Kelleher’s waiver document and PSA/DNA has given them both a grade of 9. 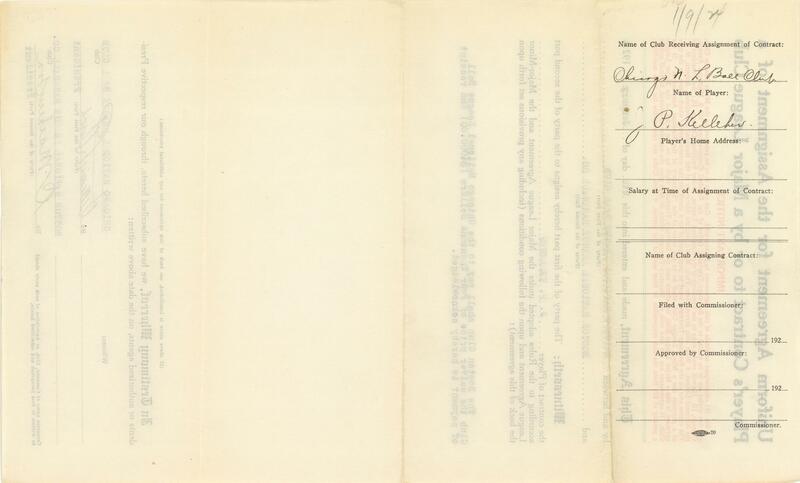 The document shows edge wear and toning with some corner dings and standard horizontal creasing from mailing. 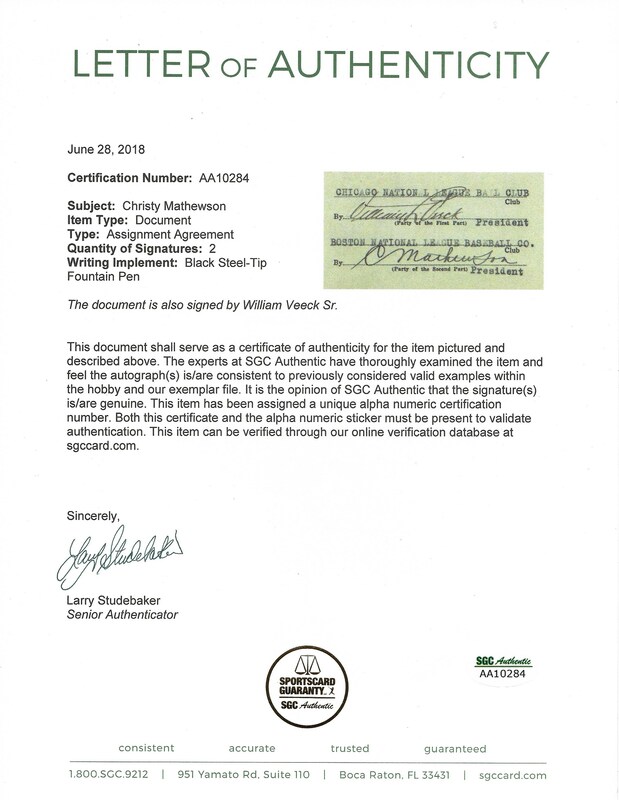 This item comes with LOAs from SGC (AA10284) and PSA/DNA (AF01063) for the signatures.